In March, 54 high school and university students from across Alberta were given the chance to get some valuable advice from some extremely talented and experienced members of the synthetic biology research and industry community. Over the weekend of March 2-3, five student teams – and hopeful competitors in the iGEM (International Genetically Engineered Machines) competition – converged at the University of Lethbridge campus for a weekend of mentorship, exploration, and hands-on skill building. The workshop consisted of “wet lab” sessions – where students spend a day in a working university laboratory, conducting bioengineering experiments – and iGEM-focused seminars. Over two days, this hands-on workshop gave students the opportunity to learn standard wet lab protocols and develop their iGEM projects with the assistance of experienced mentors and instructors. 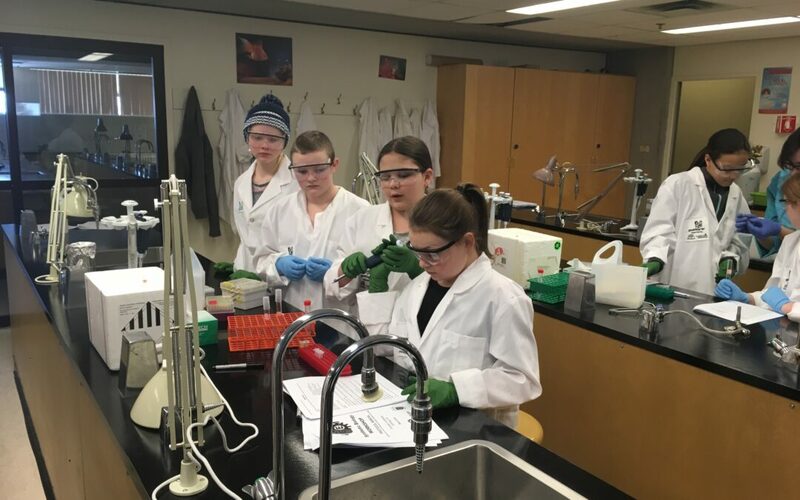 The hands-on lab sessions were run by Laura Keffer-Wilkes, Manager of SynBridge Infrastructure – the main synthetic biology branch at the University of Lethbridge – with the help of student mentors, Kristi Turton and Luke Saville. The seminars were led by experienced professionals and mentors, including Emily Hicks, President of FREDsense Technologies; Ethan Agena, University of Alberta student majoring in engineering; Chris Isaac, University of Lethbridge student majoring in bioinformatics; and Sydnee Calhoun, University of Lethbridge student majoring in biochemistry. The seminars covered a wide range of topics, exposing students to a variety of aspects in these STEM-based industries, including integrated human practices, designing and ordering genes, team marketing and branding, and Wiki coding and coding practice. The next geekStarter event will welcome Alberta students working on robotics and automation projects for a day-long skills building and project development workshop Saturday, April 13, 2019 in Edmonton. For more information, please visit mindfuel.ca/geekStarter.